Chodala was born in the Urshilaku tribe of the Vvardenfell Ashlanders. He became the ashkhan of the tribe at a young age. He and some of his people took part in the war against Ada'Soom Dir-Kamal in 2E 572, and he was also known to raid old strongholds and venture into the Red Mountain territory. All these achievements made him one of the most respected Ashlanders in Vvardenfell. His sister, Seryn, stood by his side as he gained prestige in the eyes of the tribes. He came to be respected even by the Red Exiles, a clan formed by the outcasts from the four tribes, who lent Chodala some of their warriors. Around 2E 583, Chodala invented a plan to engage and defeat the House Dunmer and elevate the Ashlanders to their rightful status. He somehow learned that Sunna'rah, a powerful staff created by Sotha Sil that could steal the divine powers of the Tribunal, was about to be summoned by the Nycotic Cult, a group worshipping a twisted version of Clavicus Vile. He ordered his Red Exiles to infiltrate the ritual site in the Shulk Ore Mine near Balmora and steal the staff once the ritual is complete. The Red Exiles succeeded and retrieved the staff for Chodala, who began to use it to slowly drain the divine power from Vivec. Vivec began to weaken, while Chodala became virtually unstoppable. With his new powers, Chodala was able to convince the leader of the Red Exiles, Kund-ud, that he was the legendary Nerevarine, after which the whole clan pledged his loyalty to him. However, Chodala's newfound power made him arrogant and willing to use violence to reach his goals. Meanwhile, Vivec allied himself with the Soulless One and sent them to investigate why his divine power was diminishing. The Soulless One eventually travelled to Ald'ruhn, where the tribes gathered for their annual pilgrimage to the remains of the giant emperor crab Skar. There, the Soulless One met Seryn, who was concerned about her brother's change of behavior. In the meantime Chodala proclaimed himself Nerevarine to Dovrosi, the Wise Woman of the Urshilaku tribe, who then went to the Cavern of the Incarnate in the Valley of the Wind to verify the validity of his claim. The Soulless One followed Dovrosi to the Cavern, and spoke with the spirits of the Failed Incarnates - people who, like Chodala, had once falsely claimed to be the Nerevarine. They told the Soulless One about mistakes they had made, claiming that this was not the way of the Nerevarine. The Soulless One returned to Ald'ruhn, where Chodala's claim was to be officially ratified during the tribal council meeting within Skar's hollow shell. During the meeting, the Soulless One and Seryn countered Chodala's arguments with the stories of the Failed Incarnates, confirmed by their spirits, who were summoned during the meeting. 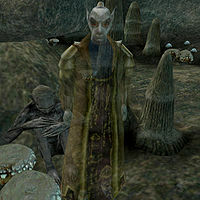 This led Dovrosi to reject Chodala's claim for the title of the Nerevarine. The angered ashkhan ordered his Red Exiles to kill everyone present; however, the Soulless One was able to defeat them. Chodala and his supporters then relocated to Kaushtarari, a Daedric shrine to Malacath in the Zafirbel Bay. While he had Sunna'rah, he was invincible. However, the Soulless One had the wizard Barilzar design and build a tonal inverter, a device that could temporarily disrupt the power of the staff. With the inverter, the Soulless One and Seryn followed Chodala into Kaushtarari, where they struck down the warmongering ashkhan and retrieved Sunna'rah. Chodala's body and some of his possessions were later brought to the Cavern of the Incarnate to rest among the other failed Incarnates. 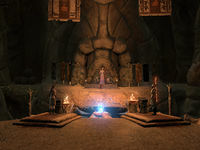 In 3E 427, the actual Nerevarine entered the Cavern to retrieve the ring Moon-and-Star during the Third Trial of the Nerevarine. There, he spoke with the spirits of the failed Incarnates, including Chodala. After telling the Nerevarine his tale, Chodala also gave him his glass axe and his boots. 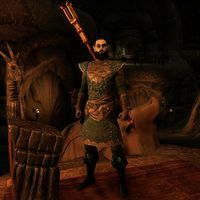 In ESO: Morrowind, he is referred to simply as "Chodala". However, a note written by him is signed "CC". This page was last modified on 21 October 2018, at 08:41.